Modern Iran emerges as uniquely as did ancient Persia. The nation’s Cinderella stories must be equally unique. 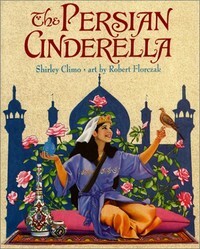 “The Persian Cinderella” indeed offers a one-of-a-kind Cinder-beauty. • Silver-grey turtledove in windows. The above-mentioned inputs ultimately make “The Persian Cinderella” uniquely unforgettable. Persian style composite animal led by peri (fairy). Toasted almonds in a wrapper. Pomegranates (Punica granatum) are cherished in Iran (modern-day Persia). The other anklet is discovered in the river water when Mehrdad’s horse resists drinking. Mehrdad’s mother makes door-to-door searches for the anklet’s wearer. Everyone must celebrate 39 days before the lovebirds’ marriage on the 40th. But stepsisters Leila and Nahid pin Settareh’s ebony tresses with six shards remaining from the jar's self-destructing rather than betraying its mistress. Settareh relocates as a turtledove to Mehrdad’s window. Mehrdad transforms Settareh by removing the shards. The lovebirds wed under showers of 1,000 pearls. Turtle doves (Streptopelia turtur) claim Iran (ancient Persia) among their extensive native homelands. Anthony Shay and Jamal of Avaz International Dance Theater, as architectural and costume consultants. Preschoolers to fourth-graders and onward. Magic helps Settareh to outsmart two jealous stepsisters and win the heart of a prince. But where most Cinderella stories end, poor Sattareh's troubles are only beginning! Unexpected plot twists in the lush setting of long-ago Persia will enchant readers. Turquoise reached Europe from Persia's famed northeastern mines in historic Khorasan Province. Climo, Shirley. 2001. The Persian Cinderella. Illustrated by Robert Florczak. New York City, NY: HarperCollins Children's Books. Crossman, Rachel Hope. 22 March 2011. “#78 The Persian Cinderella (Happy Nowruz 2011! ).” 365 Cinderellas Powered by Blogspot.com. Retrieved December 10, 2014. Lewis, Naomi. 1987. Stories from the Arabian Nights. New York, NY: Henry Holt. “The Persian Cinderella.” The Art of Robert Florczak: Art > Book Art. Retrieved December 10, 2014. Rooth, Anna Birgitta. 1951. The Cinderella Cycle. Lund, Sweden: C.W.K. Gleerup. Sierra, Judy. 1992. 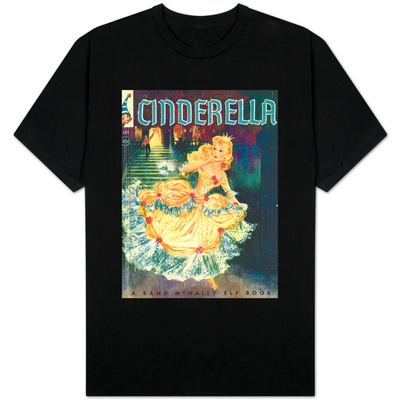 The Oryx Multicultural Folktale Series: Cinderella. Santa Barbara, CA: Greenwood. Smith, Anet. 1 October 2008. “The Persian Cinderella -- Traditional Literature.” Butterfly Wings: Our Life in Posts and Pictures Powered by WordPress.com. Retrieved December 10, 2014. Thomas, Rhonda. 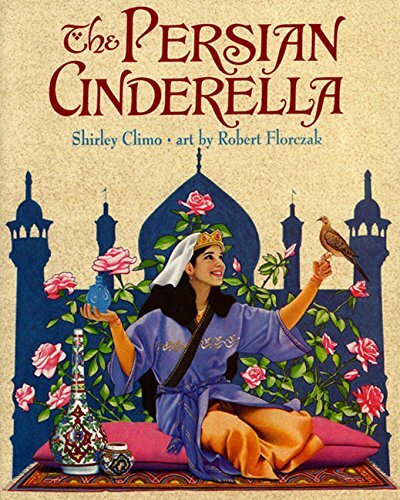 “Book Review: The Persian Cinderella Written by Shirley Climo and Illustrated by Robert Florzak [sic].” Rhonda’s Children’s and Young Adult Literature Website. Retrieved December 10, 2014. Robert Florczak, Your illustrations of "The Persian Cinderella" epitomize what I cherish most in art: color, form, timelessness, timeliness. From your other work, I know that the artistry which tells Settarah's story so elegantly and eloquently is not at all unusual. Thank you for taking the time to visit and comment, and thank you for sharing your talents with the world. Thank you for your kind and insightful review. Lybrah, The various Cinderella stories are charmingly illustrative with local uniqueness. I'm happy that you appreciate the Persian Cinderella, and I'm sure that you will enjoy the versions which I've covered from other countries. China's Cinderella story features a cave's beautiful orphan, an island’s handsome king, and a river’s golden-eyed fish. "The Korean Cinderella" is a children's story of how to be the beautiful child of beloved parents and the beloved wife of a handsome husband in seventeenth-century Korea.